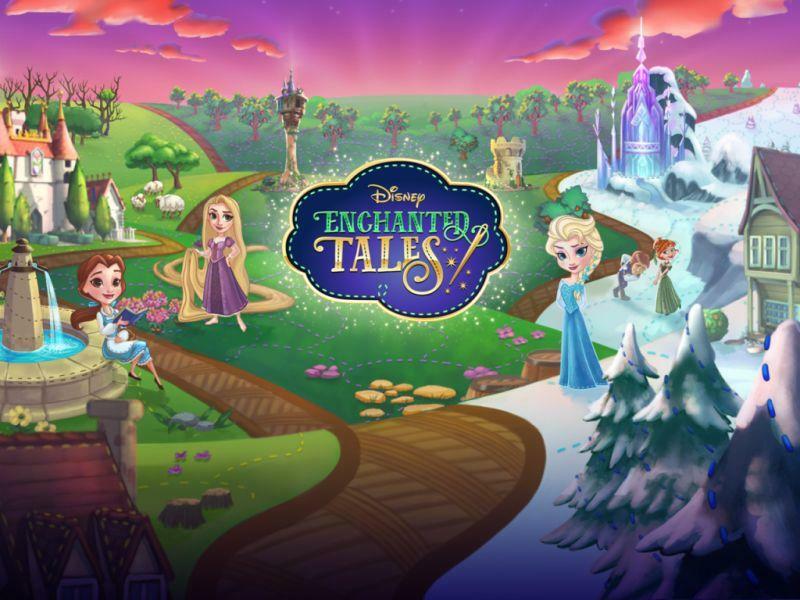 A couple weeks ago I went to the launch party of a new mobile game called Disney Enchanted Tales and, let me tell you, now I’m hooked. It’s such a fun game, and I’m going to walk you through how to get started! 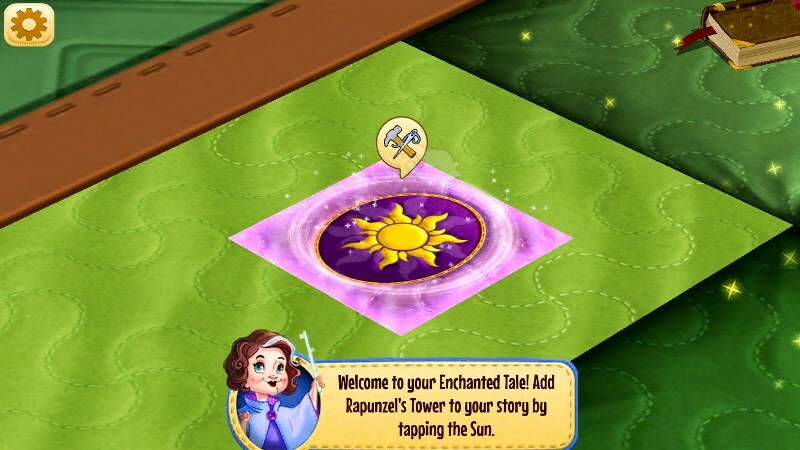 Once you download the app on your mobile device and launch it, you’ll be shown a short video explaining how all the Disney stories become intertwined in this new world. 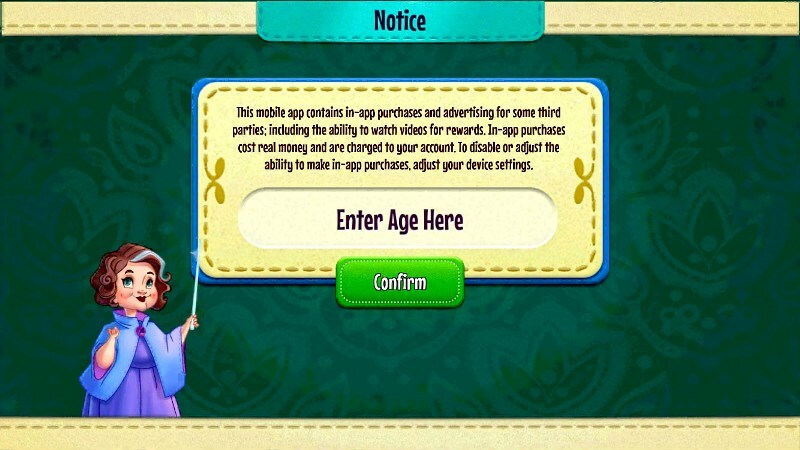 You will need to confirm your age to prove you have authority to make in-app purchases (not required, but it is an option). 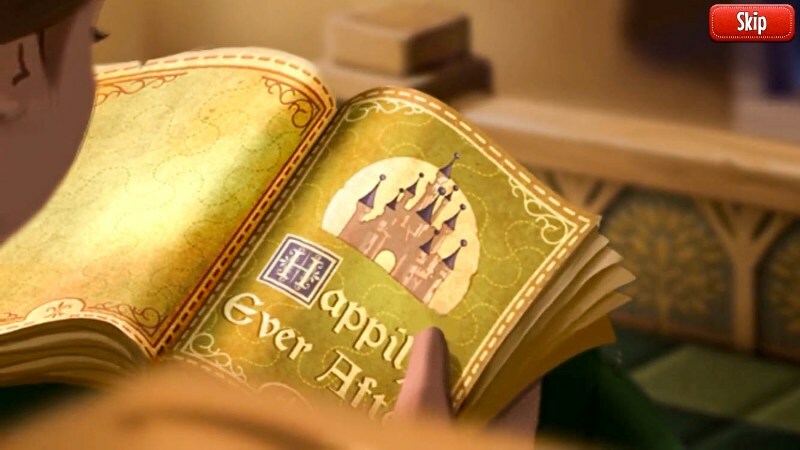 The first thing you need to do is pick your first story from Beauty and the Beast, Frozen, or Tangled. You will get all of them eventually, but you’ll be spending a lot of time with your first story so choose wisely! 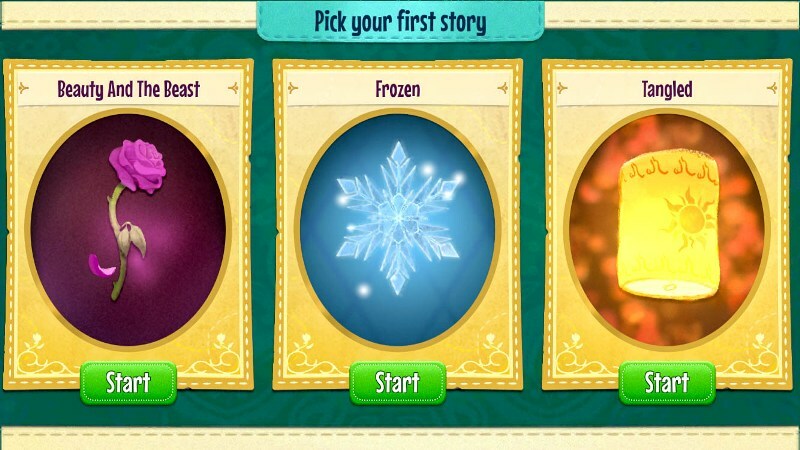 For me, my favorite of the three is Tangled so that’s what I chose to start! The great thing about this game is they have a very extensive tutorial that walks you through how to play. 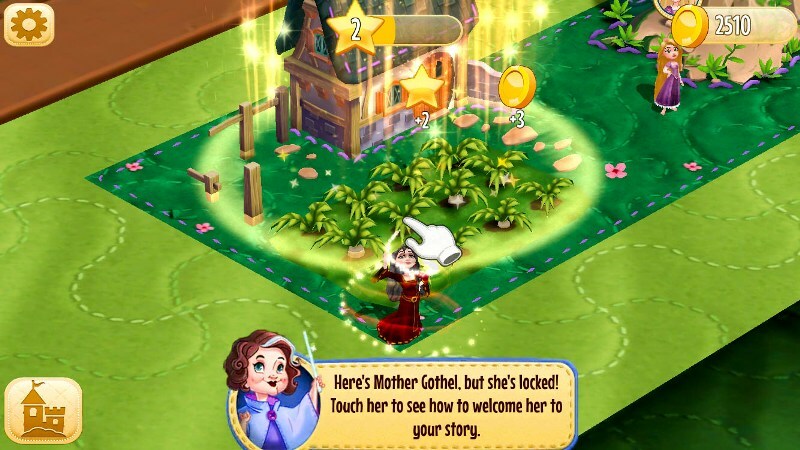 The Fairy Godmother directs you on what to do next. 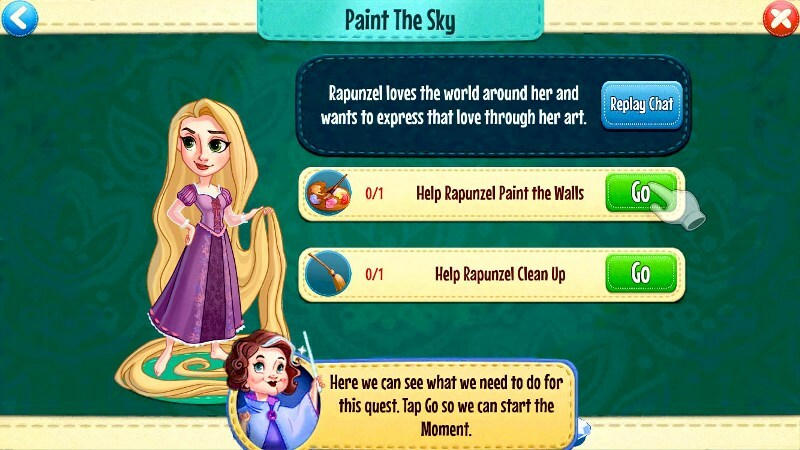 The game revolves around Moments and Quests. 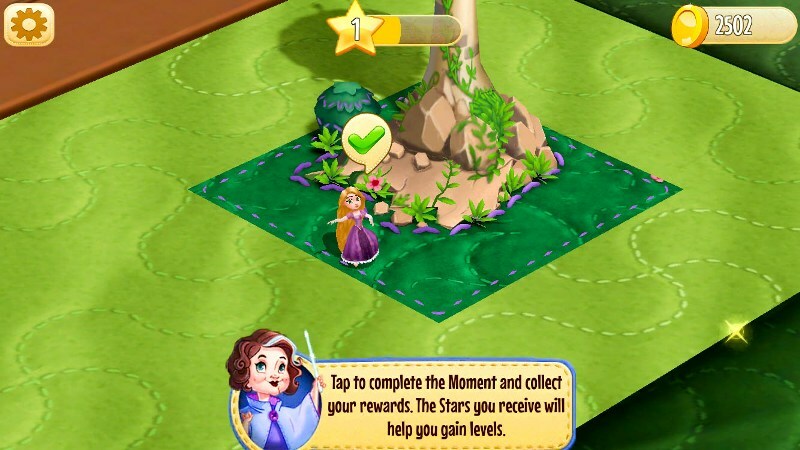 Moments are actions the characters perform, which limits that character for a set amount of time (you can’t do two Moments at once with any one character) and results in earning a set amount of stars and coins. 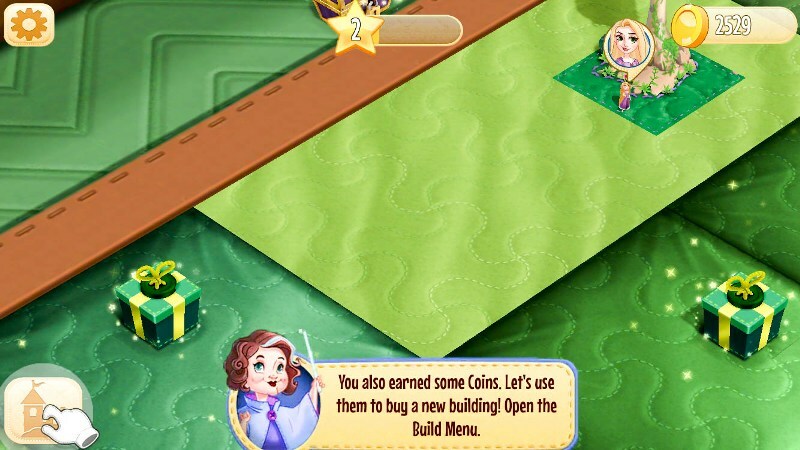 Stars help you level up, and coins allow you to purchase items from the Build Menu (more on that later). The Moments are really cute because they are all actions you will recognize from the movies. 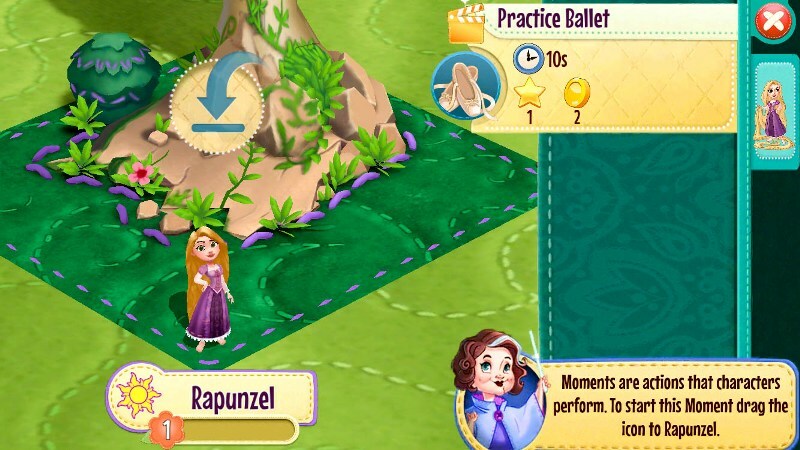 In the example here, we help Rapunzel practice ballet. 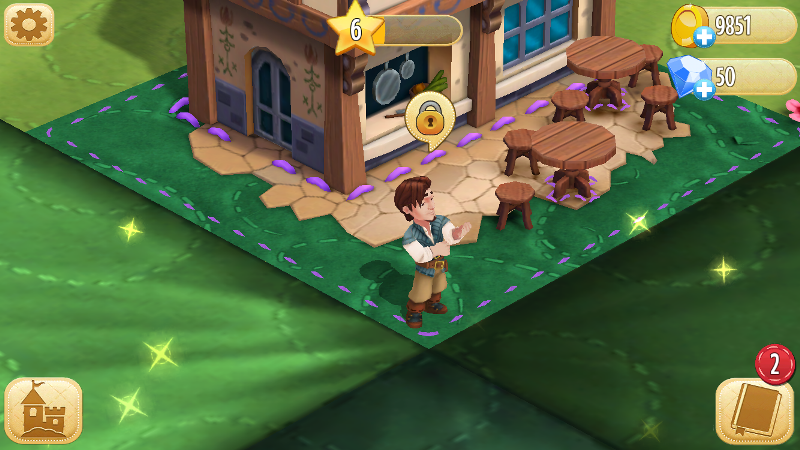 Once the alloted time has passed for the Moment you selected, a green check mark will appear above the character’s head. 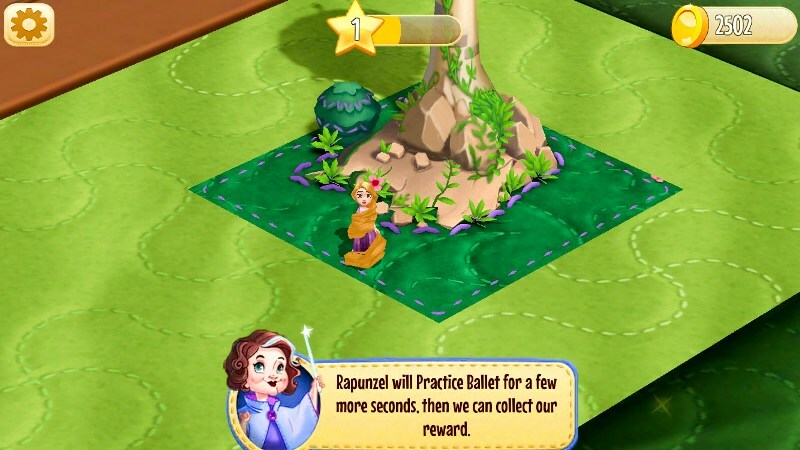 Tap this to receive your stars and coins, and free up the character for another Moment. 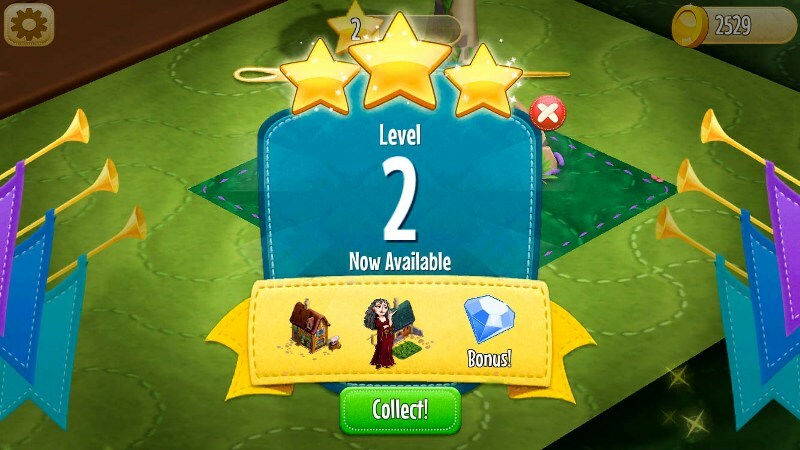 Eventually you will earn enough stars to level up. With each level you climb, it will unlock certain decor items and characters. Tap on the Build Menu in the lower left corner to see which items are available. 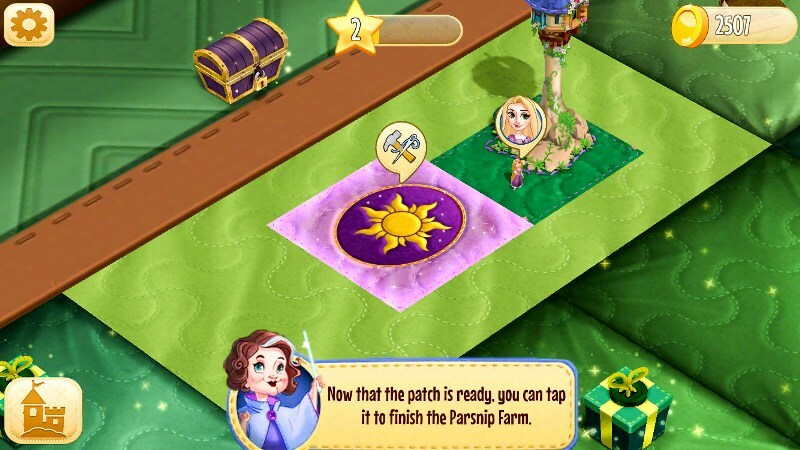 Here, I purchased the Parsnip Farm which also comes with a new character – Mother Gothel. However, new characters arrive “locked” and you must earn a few items in order to unlock the character and start interacting with them. With each new character, you’ll be instructed on how to unlock them. There are also Quests. 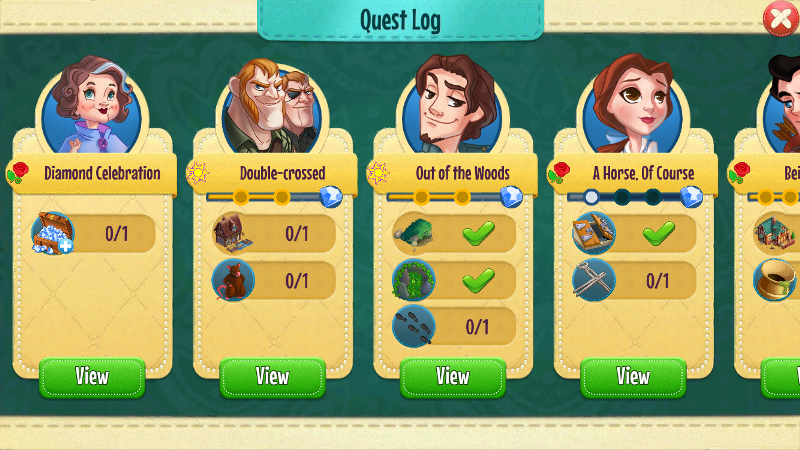 Quests are a grouping of Moments and other actionable items that result in a larger reward when completed. You can access your quests by tapping on the book icon in the lower right corner. Tap on “View” to see an individual Quest. You’ll see the Moments involved with that quest. Once you complete them all, you will earn a large reward, either coins or a diamond. You can use diamonds to speed up Moments or purchase special items. Diamonds are pretty rare … but you can purchase bundles of diamonds (and coins) using real money. 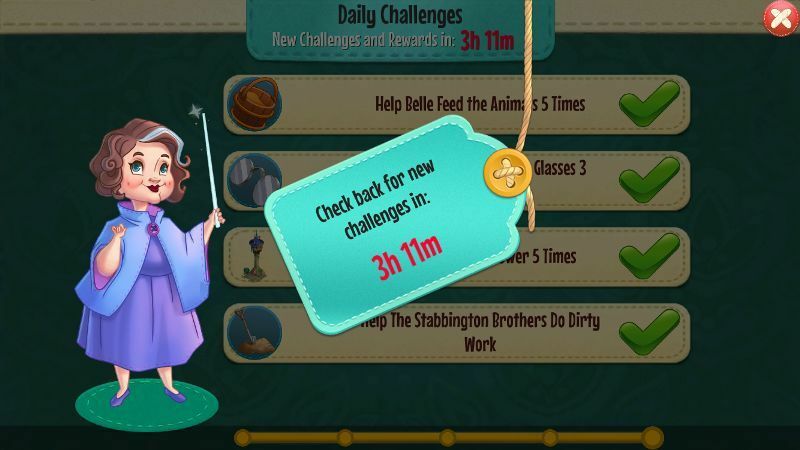 One last thing – Be sure to tap on the treasure chest every day to see the Daily Challenges. Complete them all before the end of the day to earn a special reward. That should be all you need to know to get started! 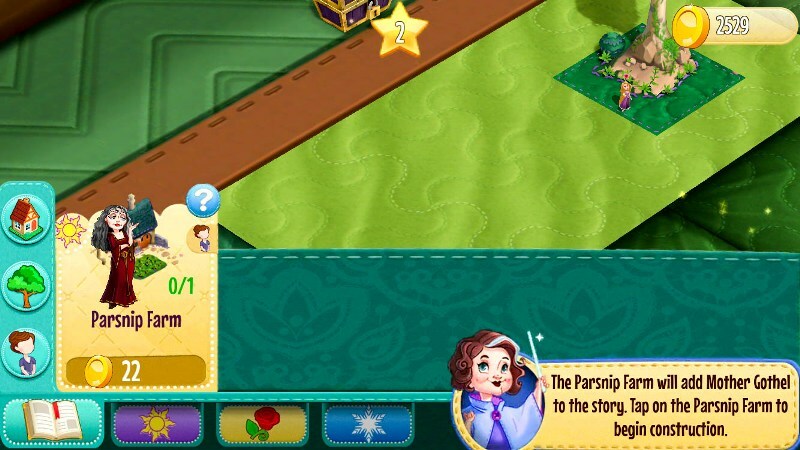 Pretty quickly you’ll discover how much fun the game is, and you’ll get the hang of Moments and Quests. Enjoy the game! This looks absolutely adorable!! Can’t wait to get my new phone so I can start playing! You can use coins or diamonds to unlock quilt squares. Tap on any empty adjacent square next to your villages, even if it doesn’t have a box on it. How do you sign into your game on a new or different device? I don’t think there’s a way to do this. On the items that we need to unlock a new character. What is the circle and the dots? It always stays the same but is different for each item. It’s an indicator of the likelihood you’ll be granted that item for each action. I believe the more dots an item has, the more rare it is. Hopefully that makes sense! They will be unlocked as you level up! I don’t … maybe try tweeting at Disney Interactive or submitting a support ticket? I’m at the same point. I want to see the finish of the stories.